After our stirring morning lecture we had a lunch stop, scoffing down arancini and very nice coffee, fueling up for the afternoons activities! The first stop for the afternoon took us further up Etna and into the snow line. 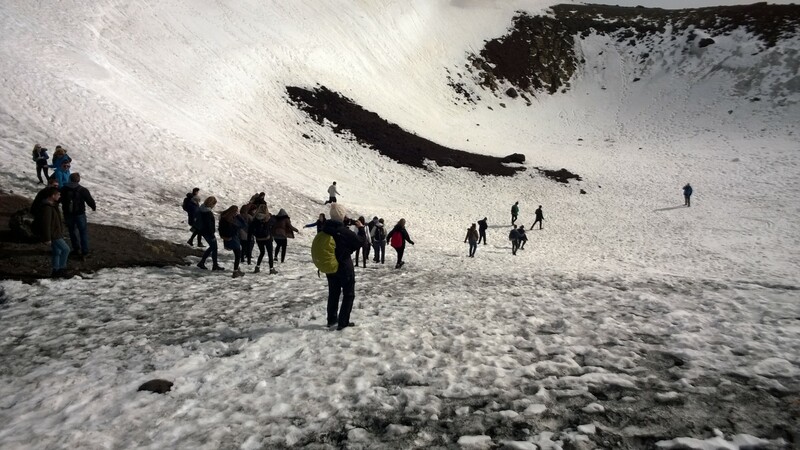 This as you can imagine, led to numerous snow balls being lobbed between students (and staff…). We climbed, with some difficulty, to a much earlier lava flow, immersed in the mist. Due to this we decided to climb higher and maybe out of the clouds. This plan turned out to be very fruitful as we emerged out of the fog and into beautiful sunshine and amazing views! Mumma Etna put on quite a show with various cones scattered around the landscape. We arrived at 1992 metres above sea level, with extensive snow cover. 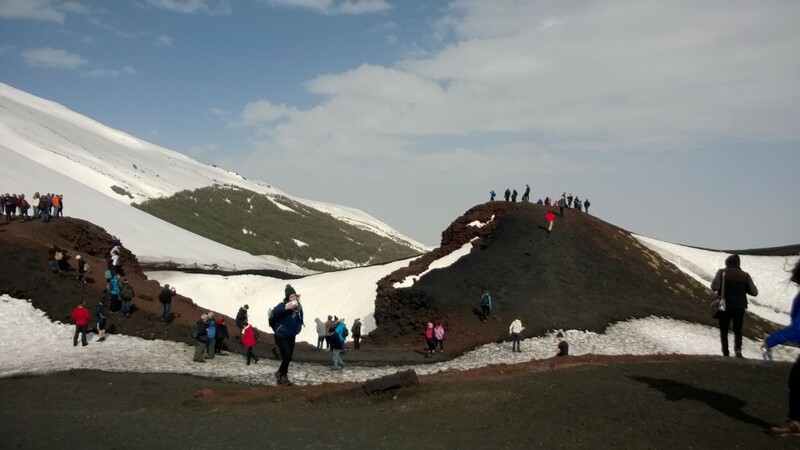 At this altitude we were able to view the majesty of the mountain and climbed down into a crater for further discussion and group photos. The weather was definitely in two halves today, misty and somewhat miserable in the morning to glorious sunshine in the afternoon with breath-taking views. It is truly a treat to hear our highly knowledgeable guide for the day inform us of the dynamics of the second most active volcano on the planet! Now it is time to descend and tuck into some lovely Sicilian food and maybe a beer or two.